Painting life is an interesting and useful app, which helps children increase their skills of recognizing images, their crative skill, stimulate their curiousness and practice their memory by painting the world around them. Kids choose their favorite plain picture and paint it with color by their thinking. 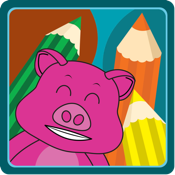 - App include fun sounds and cute animations, which will help kids not feel bored while playing and stimulate their curiousness. Let’s discover other apps which can help the children learn and play at the same time with Buzzkid.